It is hard to believe that the man who gave the world the smartest, most rational detective of all times could be taken in by an hoax. But that’s exactly what happened to Sir Arthur Conan Doyle, and more than once too. His belief in the supernatural was so strong that he allowed his wishes and emotions to overrule his head. 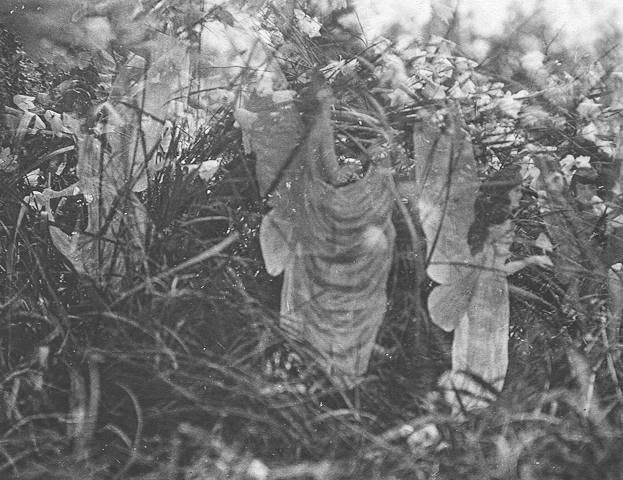 Like in the case of the Cottingley Fairies, the most famous and remarkable hoax Doyle, and half the world, fell for. In the middle of 1917, nine year old Frances Griffiths and her mother left South Africa for the UK. Once arrived, they moved in with Frances’ aunt Polly Wright, her husband, and their 16th year old daughter Elsie. 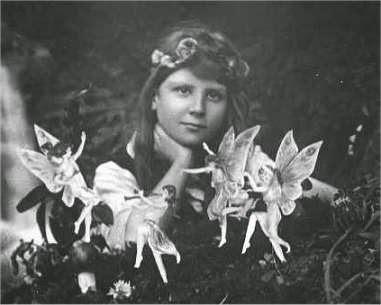 The Wrights lived in the village of Cottingley in West Yorkshire, where belief in fairies was still very much alive. The two young cousins often played beside the stream at the bottom of the garden, hoping to see fairies. Elsie was so determined to prove that fairies really existed that, one day, she borrowed her father’s camera and, together with her cousin, set out for the stream. The two girls came back 30 minutes later, triumphant. They rushed into Mr Wright’s darkroom (he was an amateur photographer and had set up one in his house) and developed the picture they had taken. It showed little Frances standing behind a bush on which four fairies were dancing. Knowing his daughter’s artistic abilities, Arthur dismissed the photo as fake. Undaunted, two months later, the girls borrowed the camera again. Once again, they were lucky. The picture they took showed Elsie with a winged gnome. Arthur thought the prank had now gone too far and forbade the girls from ever playing with his camera again. But his wife believed both pictures were authentic. Two years later, she attended a meeting of the Theosophical Society and, at the end of it, showed the pictures to the speaker, who, in turn, displayed them in a conference. Now that the pictures were out in the public eye, proving their authenticity was more important than ever. Edward Gardner, a leading member of the society, sent the pictures and negatives to photographer expert Harold Snelling, who declared that “the two negatives are entirely genuine, unfaked photographs … [with] no trace whatsoever of studio work involving card or paper models”. However, he didn’t go as far as admit the pictures showed fairies, but simply that “these are straight forward photographs of whatever was in front of the camera at the time”. It was good enough for Gardner, who started selling the pictures at his lecture. Soon, they caught the attention of Sir Arthur Conan Doyle. Commissioned by The Strand Magazine to write an article on fairies, he decided to use the pictures to accompany it. But first, both men sought a second opinion on the authenticity of the photos, this time from the photographic company Kodak. 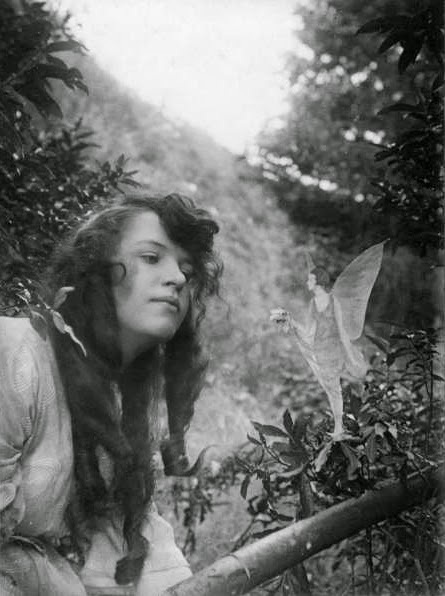 Although they said the photos “showed no signs of being faked”, they also believed that “this could not be taken as conclusive evidence … that they were authentic photographs of fairies”, and therefore refused to issue a certificate of authenticity. Ilford, another photographic company who had examined the photos, was clearer: the pictures showed “some evidence of faking”. But this opinion was quickly dismissed. Next, Gardner went to visit the Wrights, and found them an honest and respectable family. He encouraged the cousins to take more pictures of the fairies, and they readily complied. 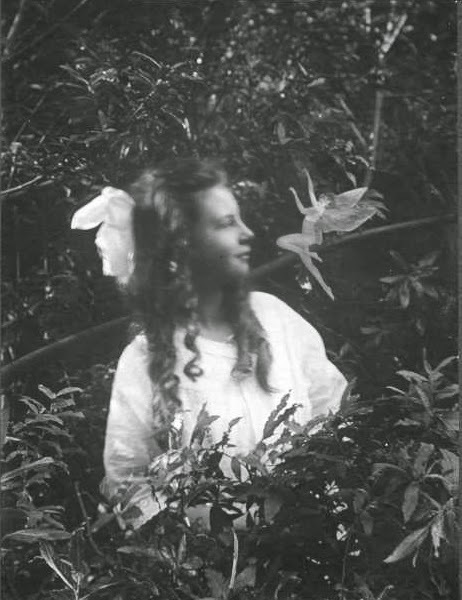 One of the new pictures showed Frances standing very close to a fairy, another fairy offering Elsie a flower, and a final one a bunch of fairies. Both Garden and Doyle were ecstatic. Doyle, who hoped the pictures may convince people that psychic phenomena were real, published his articles on fairies in the December 1920 issue of the Strand. It quickly sold out. The pictures were received with a mixture of “embarrassment and puzzlement”. Many thought they were fake, because the fairies “looked suspiciously like the traditional fairies of nursery tales” and sported “very fashionable hairstyles”. But many others were willing to believe in their authenticity. 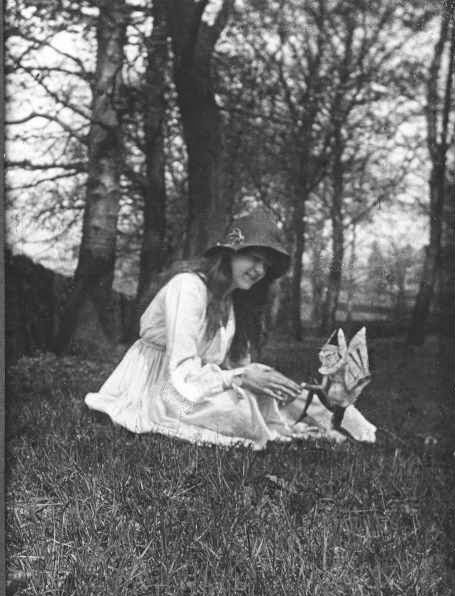 But Elsie and Frances were by now tired of this fairy business and, after 1921, so was the public. Interest started to wane. Elsie and Frances both married and, for many years, they lived abroad. Elsie was back in England in 1966, when a reporter from the Daily Express newspaper tracked her down. This time Elsie said the pictures were “photographs of figments of our imagination”. Public interest was rekindled and, although the girls stated they hadn’t fabricated the photos, these were examined again and found to be fake. Finally, in 1983, the cousins admitted the pictures were fakes. They had copied illustrations of dancing girls from Princess Mary’s Gift Book, a popular children’s book of the time, and drew wings on them. Then, they cut out the cardboard figures and supported them with hatpins. Once the photos were taken, the fake fairies were thrown in the stream. However, they both insisted they had really seen fairies, and Frances even claimed the last photo, showing only the fairies, was indeed real. They agreed, though, on why they allowed the hoax to go on for so long: “two village kids and a brilliant man like Conan Doyle – well, we could only keep quiet.” Frances added: “I never even thought of it as being a fraud – it was just Elsie and I having a bit of fun and I can’t understand to this day why they were taken in – they wanted to be taken in”.